Church was amazing (as usual) on Sunday. We've been in the middle of a series called "Setbacks," a topic to which I think every human on the planet can relate. We've all had setbacks of some kind or another. Our pastor said that you're either in one, coming out of one, or about to go into one. We've had our fair share in the last year and a half, that's for sure. But, Sunday, our youth pastor, Kevin, spoke about how "Christ's love propels us through the setbacks we create for ourselves." His illustration? Peter. Oh, Peter. I think after this week I can relate even more to this disciple of Christ, the rock upon which Christ built the church. Peter was always speaking too soon or "sticking his foot in his mouth." Kevin called it "foot-in-mouth-itis." And oh, I've had that this week. I've come armed with the sword and cut off the ear too soon. I've jumped out of the boat and walked on the sea toward my Jesus only to lose focus and begin sinking. I've done a lot of things that Peter might do. But thank God, I have a Savior that still loves me and still sees fit to use me. Even after Peter's rebuke of Jesus, even after his swift violence in the garden, even after his denial of the true Christ, Jesus still saw fit to use Peter...and use him He did. 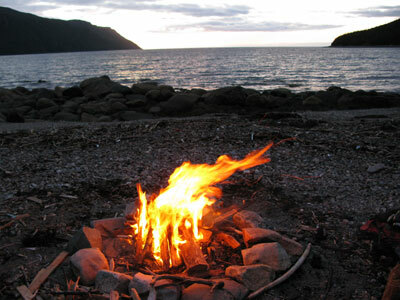 After Jesus' resurrection and before His ascension, in John 21, Peter and Jesus have a "fireside chat" one morning after a rough night of fishing. This is where He asks Peter three times, "Do you love me?" I can only imagine what that conversation must have been like for Peter...what it must have felt like to have your Savior ask you over and over if you love Him. By the 3rd time, Peter is "grieved." "Lord, You know all things. You know that I love You," Peter replies. Jesus again tells him to "feed my sheep" and after a few other statements, tells Peter "Follow me." Kevin pointed out to us that each time Jesus addresses Peter in this passage, he calls him "Simon, son of John" instead of Peter. This is significant because it was as if Jesus was saying to Peter, "Let's start this over. You've done some boneheaded things and you've had some royal screw ups but you are still going to do great things in and through Me. So let's forget about all the rest and start from here. Forgetting the past, follow Me now." My Bible actually subtitles that portion of scripture, "Jesus Restores Peter." Jesus and I have had some similar "fireside chats" of our own lately. He's asked repeatedly if I love Him, I've assured Him I do, and then He tells me something He desires of me. I agree but then go right back to my original business. But then He gives me a glimpse or a vision of how He wants to use me for His kingdom and I start to really get it. "Follow Me," He says. "Follow Me into the unknown, into the uncomfortable, into the unimaginable, and I promise that you won't regret it. Follow me and you will do great things for My kingdom." So even after all my Peter-like ways, He still desires to use me. After all of my mistakes, He restores me to who I am meant to be. So, I don't dread these occasional fireside chats with my Savior. I've come to really appreciate them. I've realized where I am flawed and where His grace must take over. I've realized areas of my life that need to change and am finally working to change them. I've realized that, like Peter, I may screw up and I may stick my foot in my mouth more times than I care to count, but Jesus will always call me by name and He will always restore me. Note: This blog has taken well over a month to write. I wanted to wait until my husband and I finished the book that went with the study by which this was inspired. Every few days I would add a few lines. I read and reread to make sure that what I was saying came out the way God would intend. I debated on whether to include some things and have prayed over this blog that it might inspire or encourage others to take a look at their walk with Christ. 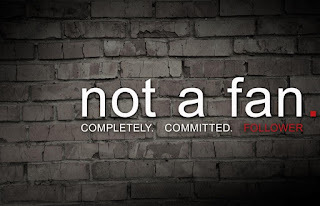 We have finished the book and I encourage every professed believer out there to read Kyle Idleman's book Not a Fan (because this post does not do it justice). And maybe, even if you're not a believer, you should read it anyway. I'm not a fan of Jesus. At least, I don't want to be. I want to be a follower. And, friends, there is a colossal difference between the two. In our small group that meets every other Saturday, we are discussing the study "Not a Fan" by Kyle Idleman, a pastor of a mega church in Kentucky. This study seriously has us reviewing our current relationship with Christ and revamping the way we pattern our lives. So, you may ask, what exactly is the difference between a fan and a follower? A fan is someone who believes Jesus is the Messiah. They may have even made a decision at one point to walk down the aisle of a church and "be saved." But what about that person's life? Does anything about that life change? Does that person change their current lifestyle and make the conscious decision to FOLLOW CHRIST completely (in their entertainment choices, relationships, language, way they treat their children, etc.)? Kyle describes a fan as "an enthusiastic admirer." That's a great depiction of a fan of Jesus. A fan thinks Jesus is great. They may attend church every Sunday, they may do all the right things or say all the right things but in their hearts, when following Jesus gets a little "uncomfortable," they tend to "jump ship." They want to follow Jesus to an extent...but when following requires denying their own desires or sacrificing anything they hold close to them, then it's not as worth it as they thought. The Church (in general) does a pretty good job of "prettying up" the gospel message. They make following Jesus look neat and tidy and they package it in a way that is the most appealing. I think the Church has good intentions, but sometimes those intentions result in unintended consequences....like having churches (especially in America) full of raving fans instead of devoted followers. Kyle discusses how even he, in an effort to make following Jesus look as appealing as possible, inadvertently managed to cheapen the gospel. Following Jesus is not meant to be easy or comfortable. If you read the words of Christ carefully, you would clearly see that. He didn't come with a "prettied up" message. He came with a dangerous and often times offensive one. He told potential followers to "Let the dead bury their own dead" (Luke 9:60) or to "sell everything and give to the poor and then come follow me" (Mark 10:21) or "The foxes have holes and the birds have nests but the Son of man has nowhere to lay His head" (Matt. 8:20). The question is: are you willing to follow whenever, wherever, whatever He may ask? He's a gentleman, so he's not going to force the issue, friends. Which category have you chosen? Are you simply a fan of Jesus? 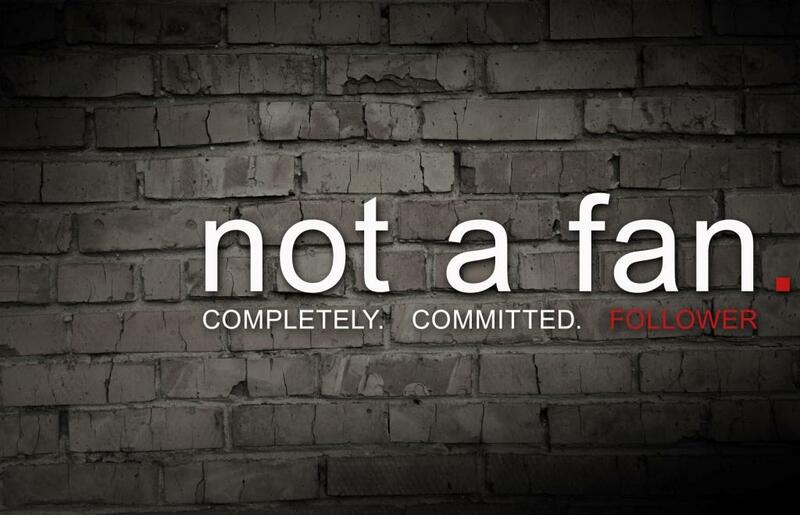 Or are you a devoted, committed follower? Me? Too often I must admit, I fall into the fan category. I'm not proud of it by any means. My desire is to be a fully committed follower of Jesus, where my answer is "Yes, Lord!" before He even tells me what it is He wants me to do. This brings me to the next point that Kyle outlines in his poignant book. We often use the term "Lord" as a sort of synonym to "God." But, the word "Lord" has some very deep connotations to it. The moniker "Lord" was used as an address to a slave's master. A slave would call their master "lord." A slave, in case you missed the memo, does not belong to themselves. They are not in control. Their master, their "lord," controls them. The disciples called themselves "slaves." So when you call God your "Lord," please know the implications of what you are saying. You are, in essence, saying that you are not your own. You BELONG to Christ. He is your Master and the filter through which all decisions are made. If you say that He is Lord of your life, well, you better live that out. By you, I first and foremost mean ME. I, for one, want to be a slave to Christ, chained to Him. Do I live that way day in and day out? Unfortunately not. But, therein lies the beauty of His grace too. Ah, grace...a topic for another time I'm afraid. Kyle tells the story of a group of missionaries who were trying desperately to reach out to an enslaved people group but their masters only allowed slaves to converse with other slaves. So, in order to reach these slaves for Christ, the missionaries SOLD THEMSELVES into slavery. My husband and I stopped after that story and pondered that for a few moments. Would we? Could we? The question arose: do we care enough about the lost to sell our own selves into slavery to reach a lost group of people? I honestly don't know. I should. I need to. I desire to have that kind of heart....that kind of passion. That's my earnest prayer: that God would break my heart in pieces for the lost and broken of this world. My husband and I pray for the salvation of a certain individual every night and in the stillness after the prayer, God has spoken multiple times to my heart: "What would you give up in order to win his soul?" At one point, plain as day, I heard Him ask, "Would you give up your own life to save his for eternity?" The answer? It took me awhile to get there. Transparently speaking, I wasn't sure. But now, without a doubt, I can say that I would. To insure that person's spot in eternity with Jesus, I would give up my own life. Now, my prayer is that I would feel that way about the rest of the lost. Then maybe I could truly call myself a follower. More and more, God is molding me and chiseling away the junk and the baggage and the icky habits. He's making me His masterpiece. He's making me a follower. I may not be where I need to be or should be or even would like to be...but I can say without reservation now: I am not a fan. If you're interested, you can purchase Kyle's book here. Read it. You won't be sorry. It's been a while since I posted anything and I don't want any of my faithful readers to think I've jumped the blogging ship. I'm still here. Life has just been really busy lately and I've had SO much on my mind that coherent thoughts haven't really been coming like they ought. I'm actually working on a post or rather, I have been working on a post for several weeks now. I add to it each week but I really want it to fully resonate with people. I want them to fully understand the implications laid out in that particular post. It's not a post I'm taking lightly at all so that's part of the reason it is taking me so long to finish it. However, I thought I would give a much needed update to my healthy journey/lifestyle change. Of course, if you are a friend of mine on facebook you have probably seen the countless posts about different milestones. But, I think I'll just talk about it again. If it can motivate anyone in anyway, then my job has been done. 1) I don't overly concern myself with what the number on the scale says. Sure, I weigh myself at least once a week, more for curiosity than anything, but I don't get discouraged when I gain a pound or two (like I used to and then subsequently drown my sorrows in a box of pizza). I know with a little extra work, it will come off. It's just a number. It doesn't define who I am. 2) I'm doing it for me. Yes, I want to feel energized so I can keep up with my son. Yes, I want my husband to be proud to call me his (which he's never given any implication otherwise but you know we women). But, ultimately, I am doing this for no one else but me. Selfish? Ah, maybe. But if I try make it about someone else, I will fail as I have in the past. I want it for me...not for anyone else. 3) I'm relying on God. This is never more present than in my current food choices. No other explanation exists for the sudden change in taste buds but God. I now can honestly say that I have a favorite veggie. I've never had a favorite veggie. If asked on some survey what my favorite veggie was, I would have left it blank. But let me tell you, if a recipe calls for zucchini, I'm most likely going to try it. I've grown quite fond of it and have labeled it a staple in my household...pretty much up there with whole wheat bread and bananas. 5) I'm still celebrating all my personal victories. I'm not getting burdened by the healthy food. I enjoy finding new recipes to try or throwing a spin on some new favorites. I keep a menu each week of the dinners we will eat. I generally leave the printed recipe out and my wonderful hubby usually has it made or almost made when I get home. That's a huge help. I eat leftovers for lunch (yes, I have grown to love leftovers). I drink water, water, and more water. I've cut out soda...had one cup in the last 4 months. Hubby and I have cut out coffee except on Sundays. That's our treat...the delectable Haitian coffee from church. We buy a cup each and we know the money goes to missions. That's the only coffee we drink during the week. So, I've lost 21 pounds total and have gone down 2 pant sizes. I felt like I had new clothes from my own closet. I know the weight I have left will come off slowly or I will definitely need decent exercise to kick start it but at this point, it's simply about being healthy. I eat a mostly vegetarian diet. I may have chicken every once in a while (like in my zucchini chicken enchiladas last night) and seafood...but for 90% of the time, I'm meat-free. Except for my occasional indulgences, I do my best to stay away from sugar and super processed foods. I'd really like to branch into full clean eating but no rush. I'm just taking it one step at a time. I know I will succeed this time because this time, it's different. It may take me another year to get to my official goal....but I'm not rushing. I'm just thrilled to finally be doing this. I'm thrilled to be in the size and weight range I was at when I first got married. Nothing will stop me from reaching my goal. I'm enjoying this journey. And I really appreciate the support and encouragement I've received from so many...especially my best friend and partner in life, my wonderful hubby. He is the biggest encouragement I have. I just hope that I can be an encouragement to others as well on their journeys. This is probably a year and a half ago but I was at my heaviest then I think. 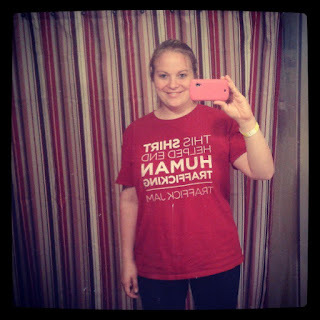 And this was me a few weeks ago after our walk-a-thon. I don't know about you...but I see a big difference.